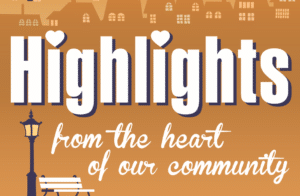 The show airing August 27, 2018 – September 3, 2018 ‘highlights’ EnAct Community Action and their upcoming Brain Bowl FunRaiser & Appalachian Children’s Chorus. We interviewed Tamara Rizk, CSBG Director and Debby Campbell, Programs Director at EnAct. EnAct Community Action is a West Virginia Community Action Agency designated by the Governor to offer a wide variety services to the low income residents of Clay, Boone, Fayette, Kanawha, and Putnam Counties. Their mission is to focus on the unique social planning responsibility of community action agencies by identifying the causes of poverty in the communities they serve, developing solutions, building active partnerships, and lifting low-income individuals and families to their fullest potential. Some of the services they provide include: help low-income & desperate people, job training, utility assistance, resume development, homemaker development, food assistance, pantries & clothing. EnAct Community Action is a Governor’s designated West Virginia Community Action Agency that provides social services to low-income individuals and families in Clay, Boone, Fayette, Kanawha and Putnam Counties. They are in the planning stages for their 3rd Annual Brain Bowl FunRaiser scheduled for Thursday, September 6, 2018 beginning at 5:30 p.m. at the Beni Kedem Shrine in Charleston, WV. The BRAIN BOWL is a fun-filled, fast paced Jeopardy style competition testing your trivia and general knowledge skills. And when you get a “Jeopardy” or “Double Jeopardy” answer, you don’t provide the question – you have to successfully complete a “Minute-To-Win-It” challenge to earn your points! They are securing corporate, organizational and business teams NOW. Teams are made up of 4 or 5 players. Entry fee per team is only $500. Call Debby to insure you are one of the 16 teams playing for the coveted Brain Bowl Trophy. 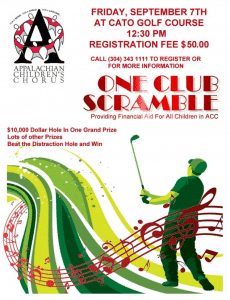 We also interviewed Selina Midkiff, Founding Director, Appalachian Children’s Chorus. Selina founded the organization 28 years ago, and she continues to serve as the Artistic Director. Their mission is to provide artistic excellence, a quality music education and extraordinary opportunities while creating a positive effect on the lives of West Viginia’s youth. They are having a One-Club Golf Scramble Tournament at Cato Golf Course on September 7, 2018 with registration and lunch beginning at 11:30 and shotgun tee off at 12:30. Please support them if possible. All proceeds assist with youth scholarships for the organization. Sponsorships and Hole Sponsorships are available. Call 304-343-1111 for all the details and information. Promises to be a lot of fun and for a wonderful youth organization. PreviousPrevious post:Upper Kanawha Valley Today TV Show Features Marshall UniversityNextNext post:Is The Universe Giving You The Green Light?